Press Release (ePRNews.com) - Melbourne, Australia - Sep 05, 2017 - United Homes Australia is the leading home builder company, known for its luxurious designs and quality constructions in Melbourne. They have built hundreds of high-end homes using only the best grade materials as well as artistry. The company prides itself in developing budget-friendly homes with uncompromised quality. Clients can trust these experts to deliver luxurious as well as stunning units, display homes, and commercial buildings that suit their specification and preference. Their drive, passion, commitment and close communication with clients goes a long way in ensuring they deliver. UHA is a renowned townhouse builder, providing their exceptional services in Melbourne and its environs. They have a team of very skilled and competent experts who take time to walk clients through all the steps involved in the construction of the houses; starting from legal requirements, through to design and building and handing over the keys to the tenants. Investors who are considering townhouses developments in Melbourne can browse through the company’s portfolio. All their buildings are a clear reflection of the skills of the most amazing and experienced designers and builders offered by the industry. The Consultant further stated, “Our team is made up of experts who bag over a decade extensive unit dwellings and townhouses in the region. Owing to our stay in the industry, we have comprehensive knowledge and understanding of the demands and all the emerging trends. Above all, you’ll be pleased to know that our excellent project management team is always keen to see that only highest quality construction materials and highly skilled artistry blend to deliver stunning finishes, on time and within budget. 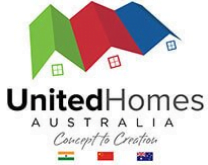 United Homes Australia has built hundreds of beautiful houses across Melbourne for investors and individuals who truly understand luxury and quality and are in search of a builder who will confidently embrace their vision. All their homes reflect the owner’s unique personality. Purchasing a home, or having it built is an expensive venture, and everyone expects to get a value for money. With UHA, one need not worry, because they are getting over 25 years of experience in their projects; nothing could go wrong. UHA is amongst the best luxury builders in Melbourne. Contact them today for all townhouse development needs.